Here it is! If you need everything needed to make snow and you are not ready to step up to the bigger guns, look no further. This package has been perfectly matched to your SNOPRO. We researched and tested literally dozens of pressure washers and air compressors until we found the perfect match of specs and quality we demand from our equipment. With this package you will receive a SNOPRO™ snow maker, a 1.3gpm Electric Pressure Washer (upgradeable to 1.6gpm), and a 4.4cfm Ingersoll Rand Air Compressor. Don’t let the SNOPRO’s size fool you - this snowmaker performs! This unit is a great introduction to snowmaking with a maximum snow making capacity from 35-46 ft 3/ hr based on your pressure washer choice (cover approx 40’ x 20’ with 6” in 8 hours). An optional light kit is available to make visual checks easy and convenient. AR Blue Clean pressure, boy do we love this little unit. We ran this pump for days on end in the heat to see if it would hold up under the heavy duty requirements of snowmaking and it came through with flying colors. The included wand kit makes quick work of cleaning projects around the house (and shop). 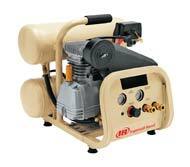 Ingersoll Rand is synonymous with high quality in the world of air compressors. This little unit delivers better than any compressor we tested in this category and the only compressor that actually produced what the manufacture spec claims (4.4cfm @ 90PSI). In addition you will also receive a SAH Blow-Out Tool™ to remove water from your snowmaking system and prevent destructive freezing issues, In-Line Water Filter to prevent sediment and filtrates from entering your pump, Lance kit with wand, and 20’ of extension hose. Finally we add a heavy duty brass garden hose connector for your pressure washer to increase the durability of the connection. Make snow at home with the SNOPRO snowmaking package. Don’t forget to check out the optional light accessory kit designed exclusively for the SNOPRO.